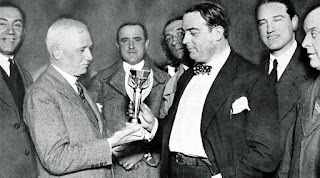 In 1928, FIFA decided to stage their own international tournament. Jules Rimet (1873- 1956) was the organisation’s president and arranged the inaugural World Cup tournament. Uruguay was chosen as the host country and the national associations of selected nations were invited to send a team. At first, the choice of venue did not meet with European approval and major competitors like Italy, England (three-time Olympic gold medallists), the Netherlands, Germany, Spain and Sweden decided not to participate. Uruguay offered to pay all travel and hotel expenses for the visiting teams, but many players feared not having a job to return to after the competition. 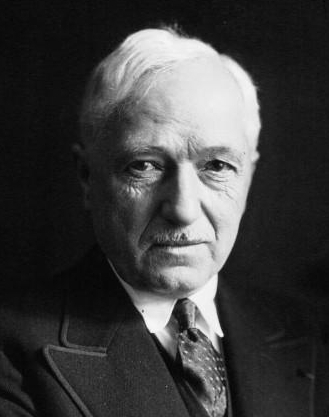 When it appeared not a single European nation was committed to playing, the FIFA president Jules Rimet stepped in and exerted some pressure. Belgium, Romania, Yugoslavia and France all did an about-face and decided to take part. King Carol of Romania in return for selecting his countriy's team, gave them a three-month vacation and guaranteed their jobs would be waiting for them on their return. In total, 13 nations took part i.e. seven from South America, four from Europe and two from North America. The draw for the 1930 World Cup did not take place until the teams arrived in Uruguay just days before the tournament began. 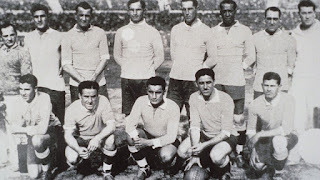 The 13 teams were divided into four groups: Pool 1 consisted of Argentina, Chile, France and Mexico; Pool 2 saw Yugoslavia grouped with Brazil and Bolivia; Uruguay competed in Group 3 alongside Romania and Peru, while Pool 4 was made up of the U.S., Belgium and Paraguay. The four pool winners advanced directly to the semi-finals. 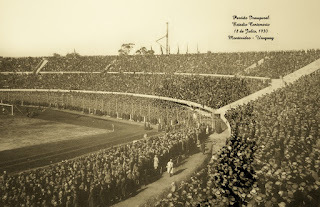 The 1930 FIFA World Cup TM took place at the brand-new Estadio Centenario (built specifically for the World Cup), in Montevideo. All the games were played in the city and only three stadiums were used to host all 18 games. The first goal in World Cup history was scored by Lucien Laurent of France scored the first goal of the competition in the 19th minute of France’s 4-1 win over Mexico. Bert Patenaude (U.S.) netted the first hat trick in their 3–0 win against Paraguay. 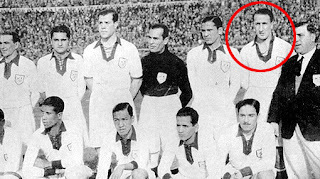 However, some historians maintain Argentina’s Guillermo Stabile was the first to do it, with three goals two days later against Mexico. Some match reports list Patenaude’s second goal against Paraguay as credited to Thomas Florie. The first penalty scored was by Manuel Rosas of Mexico. Argentina’s Guillermo Stabile scored 8 goals over the competition which made him the highest scoring player. Overall there were 70 goals recorded, with an average of 3.89 per game. The competition was not without controversy. 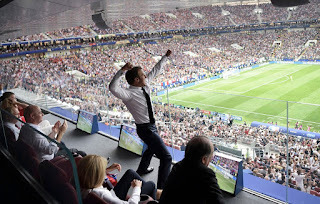 France lost to Argentina 1-0 but it was soon made clear by the French, Brazilian referee Almeida Rego had mistakenly blew the final whistle six minutes early. The teams were brought back to finish the game. Mario de Las Casas (Peru) was first player in World Cup history to be sent off. He was sent off in Peru’s 3-1 loss to Romania in the first round. Uruguay christened the new stadium by defeating Peru 1-0 in its opening match. Overall 434,500 attended the competition with an average gate of 24,139. Only 300 fans came to see Romania’s 3-1 win over Peru which is still lowest recorded attendance for a single game in World Cup history. After beating Belgium, the United States beat Paraguay to set up a semi-final match with Argentina, which they lost 6-1. 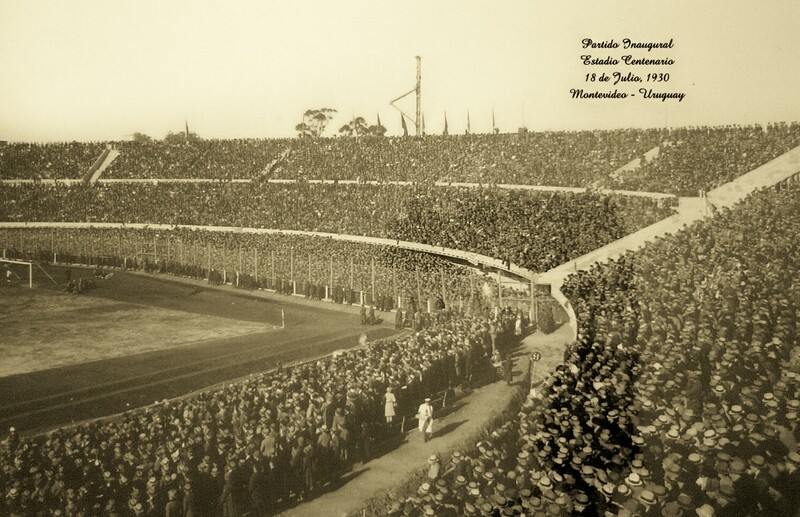 The largest crowd of the tournament was 93,000 for Uruguay’s 6-1 win over Yugoslavia in the semi-finals. 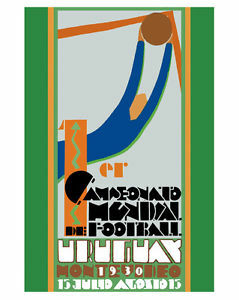 The final of the 1930 FIFA World Cup TM was held at Montevideo’s Centenario stadium. A crowd of 90,000 spectators watched as Uruguay beat Argentina 4-2 to become the first FIFA World Cup TM Champions. 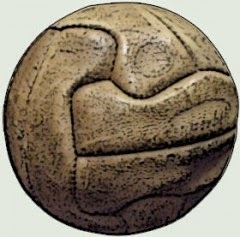 In the final of the 1930 World Cup, Argentina and Uruguay, the teams could not agree on which ball to use. So they decided to use an Argentinean ball the first half and a ball supplied by Uruguay in the second half. Argentina were ahead at halftime 2-1, however, Uruguay came back to win the match in the second half 4-2 using their own ball. The Jules Rimet Trophy was designed by Abel Lafleur and made of gold-plated sterling silver on a white/yellow marble base. It comprised a decagonal cup, supported by a winged figure representing Nike, the ancient Greek goddess of victory. Dubbed "Victory", it was generally referred to as the World Cup or Coupe du Monde. 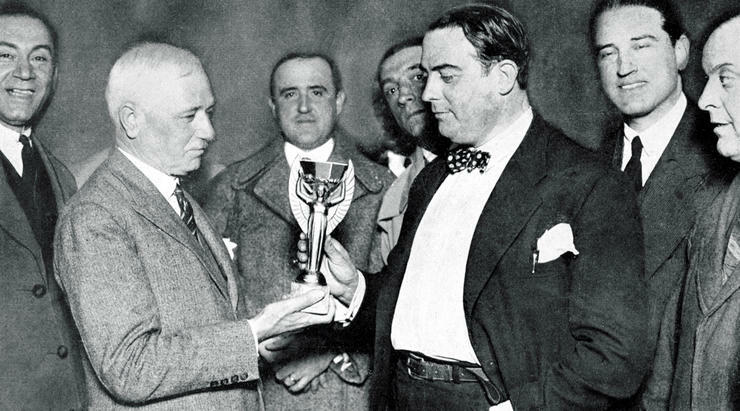 The first world cup stood 35 centimetres (14 in) high and weighed 3.8 kilograms (8.4 lb).